Time to once again dig through our old Disney pictures for a photo flashback. 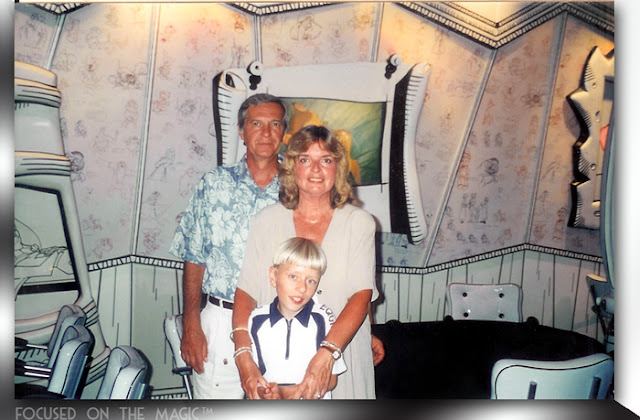 Today's picture is from a magical cruise aboard The Magic a long time ago, possibly 1999 or 2000. It was taken after dinner at The Animator's Palate. We had spent the day touring Nassau on motorbikes. I found it in a box in the basement separated from the negative and photo album. 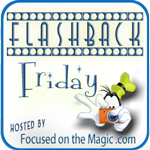 This is why I love Flashback Friday! It gets me to scan, file and scrap my old pictures. I don't know why DS#1, Stig isn't in the picture, my guess is he's taking it. Note the walls and pictures on the wall are in black and white. Throughout the evening the wall art change colors and the screens become animated. The little video below shows an example of the newest artwork that can be found on the Disney Fantasy. Disney Imagineers are always moving forward in technology and this a great example. The newer ships have switched to fabulous LCD screens that are motion activated! Can you imagine walking by this at night after a few? New to our Blog Hops? Questions? Here's a link to the 411 on our blog hops. Feel free to email me with any questions. Please leave a comment and tell me what you think of the new button at the top of the page. I've ready about this restaurant before and would LOVE to see it in person! Thanks for the video. Fun flashback and forward. Those in the photo look so happy. Think I need a cruise. I love #Disney cruises. I look so sunburned in that picture. We were riding around Nassau on motorbikes all day. Good times! Thanks Diane! I can't wait to cruise on the Dream and the Fantasy!! Hopefully this summer!